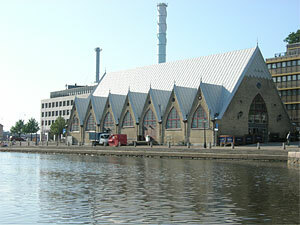 Fiskekyrkan in Gothenburg, Sweden - The fishplace that looks like a church. Adress: By the canal of Rosenlund. For you who loves shellfish, can´t miss this place and the building itself is also one of Gothenburgs many nice buildings. The name of the building is from that that it lookes like a church. You will find the Feskekörkan or Fiskhallen by the canal. Victor Von Gegerfelt is the architect and it was inaugurated year 1874. He has also drawn many other famous buildings in Gothenburg, as for example Sociala huset and the artshool Valand. On Sundays and Mondays Fiskekyrkan is closed. But the rest of the days you can buy delicacy things from the ocean - their speciality is fish. The first trade with fish in Gothenburg was held at Lilla Torget and during that time the name of the place was Fisktorget. More fishing places in town, was among others at the big canal in the city below the German Church, Gustav Adolfs Torg and Stora Bommen. 1849 the only place for fishtrade was held at Rosenlund. After that it was Feskekörkan. Now a times, outside Feskekyrkan in the canal you can see people fishing. If they have good luck, they may get a salmon at their fishing rod. Here you also can eat a good meal and get the fish for the day served at your plate.